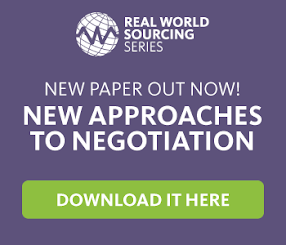 The other week, BravoSolution held their third event in the 2014 Real World Sourcing Series: Owning the Space – Working with Stakeholders, led by Guy Allen. Now I'll be honest, the title made me sceptical. I was expecting some sort of motivational speech; however, I was more than pleasantly surprised. This session contained minimal motivational "go get em's" or "you are lions" style quotes but more of a dose of psychology, self diagnosis and truth telling. Guy began his presentation by explaining the need to put some key foundations in place; positioning yourself as credible. If you are the expert, be the expert, or someone else will. And so the tone was set for the procurement professionals in the room; who out of us really owns the expert role in the procurement field in which we work? Throughout the session, Guy set a number of interactive tasks. The first; how much addressable spend should procurement as a function own? My stab at it, and what I thought was a fairly extreme answer, was 100%. This, however, turned out to be the same opinion as our speaker; and why not? Is procurement really owning its space? It seemed from the answers in the room that it wasn't. So what are your thoughts? “The size and maturity of the function is the main thing holding this back” – is there any truth behind this? Should we be more tenacious and do a land grab on the categories of spend within an organisation? Tenacity seemed to be one of the themes I picked up from the session. Being tenacious and passionate linked us back to this idea of the perception of procurement, which reminded me of a point that Guy made in his presentation; “If you think you’ve got it, you’ve got it. If you don’t think you’ve got it, even if you have got the power, you haven’t”. This led us on to the Johari window; a tool that places your perceptions against what other perceive. Do we, as procurement professionals, understand how other functional departments view us? We may see the RFx process as a way to control and maintain a fair procurement process, but it may be perceived as a bureaucracy by internal clients. Where eAuctions are a potential savings opportunity, they might otherwise be seen as a loss in the control of decision making. How often have you experienced the same sort of response or push back? Guy then had us each rank the view of how exciting certain departments and corporate functions were. Only two out of fifty procurement professionals in the room put procurement first. My table, with backgrounds in utilities, banking, FMCG, consultancy and IT ended up debating over whether logistics is more exciting than production, both of which were still ranked higher than procurement. Then came a positioning task. Guy discussed the difference between attitude and mission statements, and then went on to have us create our own attitude statements so that we align our objectives to the corporate objectives. Why not take a more aggressive stance? From the department often shoved in the annex of the building or stationery cupboard, why not be more forceful? Don't sell procurement within the organisation. Mandate it. Who's with me! No? Ok, how about understanding better our sense of purpose? If we don't know, how should anyone else? Does what we say translate well to other departments? Let’s say we’ve managed to position ourselves, the procurement function, with a strong alignment to corporate objectives. What next? Guy closed the session with a nod towards internal stakeholders. We mustn’t forget the importance of a strong stakeholder relationship, so maybe my forceful route above is a bit strong. The message here is to tailor the approach, institutionalise the knowledge and sell in the benefits using the best environment to engage with the stakeholders you need to bring on board. This last point reminded me of a book I recently read, “The CPO – Transforming Procurement in the Real World”, where many overlapping themes can be found in the book and Guy’s session. In essence, don't force the solution down throats because ‘you know the benefits work’. Engage the stakeholders and show how it works to benefit their goals and corporate goals. You can download the slides from Guy’s session here.